it should fit in most crew cab pickups and even cars.Aside from being made by one of the more reputable brands, this Pioneer subwoofer features an oversized cone. It allows more air to go around, resulting to accurate bass response. It also has angled push terminals that make installation a lot easier. This subwoofer has Pioneer’s familiar angled push terminals. It is designed not only to make installation easy but also save space. Unlike other subwoofer terminals that are vertically or horizontally mounted, angled push terminals are designed to reduce the stress on the wires. Traditional subwoofer terminals are mounted in such a way that wires are bent to fit, which can affect the output of the sub. That won’t likely happen with this sub. This 12-inch sub has an oversized cone made of mica-injected molded resin. The cone is designed to allow more air to move around, resulting in the superior bass response. Plus, it has a dual spider venting design that stabilizes the cone. It also supports the linear movement which in turn allows the sub to pump out the big volume. The enclosure of the sub should also be mentioned. It is made of medium density, fiberboard. It is covered with a black carpet, giving it a premium look. The carpet also gives the enclosure a non-slip and scratch resistant surface. This can be mounted using the two L brackets and eight mounting screws included in the product package. This shallow mount subwoofer won’t take up a lot of space in your car. It measures 9.29 inches, 23.43 inches, 17.2 inches (length, width, and depth). Most owners have put theirs in the trunk and at the back of their seats. 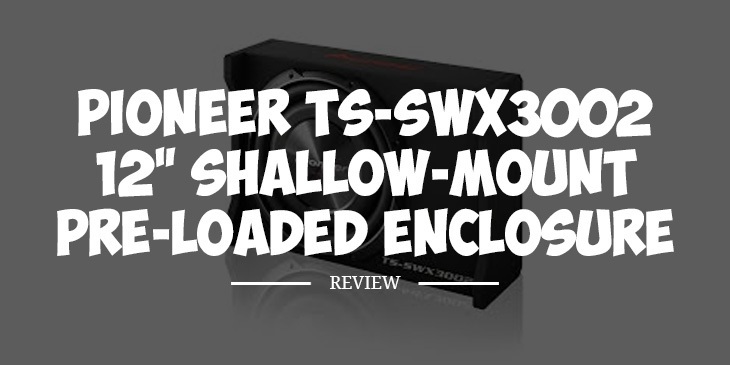 This subwoofer will add sufficient bass to your existing car audio system. It can handle a power of 400 watts, with a peak power of 1,500 watts. Q.How long is the warranty? A.Pioneer backs it up with a 1 year warranty. Q.What is the weight of this subwoofer? A. It weighs 25 pounds. You can’t go wrong with this Pioneer subwoofer. Sure, it won’t overwhelm you with its bass but it should be very good enough for motorists who want to feel the low notes in their cars. It is also very compact and thus shouldn’t get space that you would otherwise have for your passengers and cargo. Like most Pioneer subs, this subwoofer isn’t cheap at all. But you will be getting your money’s worth with this sub. Its cone is designed to resist overheating, and should keep the subwoofer blasting even for hours. I haven’t read any review online indicating that this sub easily blows out. I think that’s a testament to how durable this sub is. This is a subwoofer that I can recommend for motorists who want to soup up their rides by improving their car audio systems.